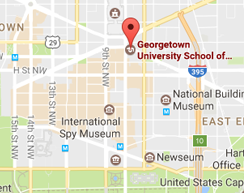 If you're looking to host your next event, select spaces within SCS's 640 Massachusetts Ave. NW building are available for rental. Space requests are reviewed on an individual basis. The School of Continuing Studies and Georgetown University reserve the right to determine if an event is appropriate and consistent with the mission and values of the University. How Do I Request a Space? If you are an SCS student group, contact your program staff for an events request form. Do you anticipate any VIPs to attend? Do you foresee any threat concerns? Will there be a need for additional security? Audio/Visual: All classrooms and most other spaces at 640 Massachusetts Ave. NW come equipped with standard audio/visual equipment (i.e., computer, projector, speakers, etc. ); organizations requesting use of space are responsible for coordinating additional A/V needs. Catering: Organizations requesting use of space are responsible for purchasing and coordinating catering. Vendors: Select from a list of SCS-approved A/V equipment and catering vendors.